The Great Gatsby will always be an unfilmable novel, because most of its drama resides in the space between the characters' snappy dialogue and their unspoken feelings of ennui, disappointment, and despair. This may explain why, transposed to the screen, Gatsby tends to become the very thing it abhors: a wild, loud party. The hyperbolic Australian director Baz Luhrmann (Moulin Rouge!) is exactly the wrong person to adapt such a delicately rendered story, and his 3D feature plays like a ghastly Roaring 20s blowout at a sorority house. 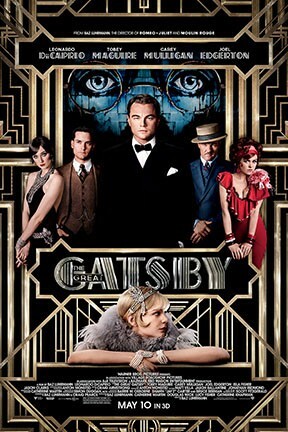 Leonardo DiCaprio is typically fine in the title role, grasping the deep insecurity that forces Gatsby to worship his lost love, Daisy, from a mansion across Long Island Sound, but Tobey Maguire is too ingratiating to play Nick Carraway, the story's actual protagonist, who's enticed by the endless carousing at Gatsby's mansion but still rooted in the midwestern values the other characters have abandoned as hopelessly passe. With Carey Mulligan and Joel Edgerton. The Great Gatsby, The Great Gatsby, The Great Gatsby and The Great Gatsby 3D are not showing in any theaters in the area.